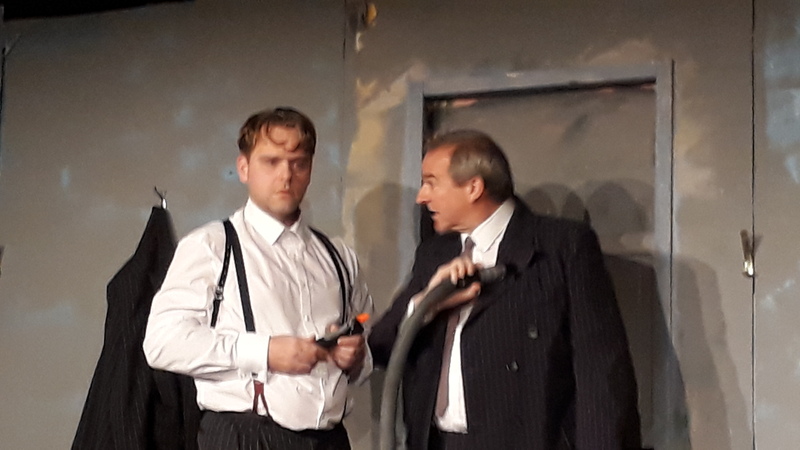 Guns, trauma and an implied menace lie behind two plays staged this week in Axbridge Town Hall. The dramas are Samuel Beckett’s Footfalls and Harold Pinter’s The Dumb Waiter staged by the town’s community theatre group ACT. One is a timely piece about a woman suffering from some form of post dramatic stress syndrome while the Pinter black comedy is all about two hit men waiting to kill someone. Hannah Strohmeier as May in the Beckett play paces the stage nine steps at a time echoing an inner voice played by Janet Gwinn as she attempts to understand a troubled past. The drama directed by Phil Saunders is poignant, mysterious and rather Gothic in its simplicity leaving many questions unanswered. Who is she, what happened and why does she keep walking backwards and forwards? Shrouded in greyish robes Strohmeier cuts a tragic figure as she brings her enigmatic character to life. In Pinter’s The Dumb Waiter Tony Wilson as gangster Ben has something of a Backstop Irish accent. Is he north or south of the border? Is he really a killer or a bluffer? Meanwhile Will Vero as Gus hails from London’s East End giving a committed performance exuding menace and stupidity in equal portions. Wilson pontificates and reads the paper as he lies on a bed in the dingy basement as the orders from a restaurant above keep coming. An entertaining and enjoyable black comedy with two actors on top form in which the audience are left guessing as to what the plays are really all about. The double bill runs until Saturday. Novmber 21-24, 2018.